The Shandwick stone, or Clach a’Charaidh, (see HER MHG8539) is one of a group of Class II Pictish symbol stones on the Tarbat peninsula seaboard, These are carved rectangular slabs several metres high which typically feature a large cross on one side, plus elaborate decoration, enigmatic Pictish symbols and secular or biblical scenes. They are thought to date from the 8th or 9th Centuries AD. For a general guide to the Pictish stones in the Easter Ross area see the Highland Council’s Pictish Trail. In November 2015 there was a NOSAS field trip to Tarbat to visit the stone at Shandwick, along with those at Hilton of Cadboll and Nigg. Here we were able to obtain access behind the steel framed glass case which now protects the Shandwick stone against the elements. 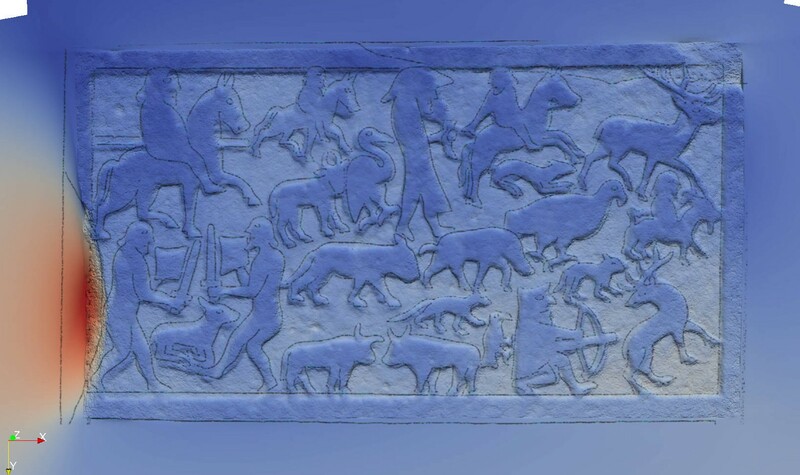 Alan Thompson took some photos of the hunting panel of the stone and then used photogrammetry to bring out the details of the scene. The top image above shows one of four camera pictures that Alan took of the panel from different angles. He then processed the four images to produce a 3D model of the surface which we can look at in different ways. The middle image shows the 3D surface with colour/texture removed, but with angled lighting applied to bring out the relief using shadowing. Finally in the lower image the 3D surface has been processed to show depth. Areas which are ‘closer’ to the viewer are dark blue, those further away lighter blue, etc to red for distant ones. The red coloured area on the left is due to a broken part of the stone. 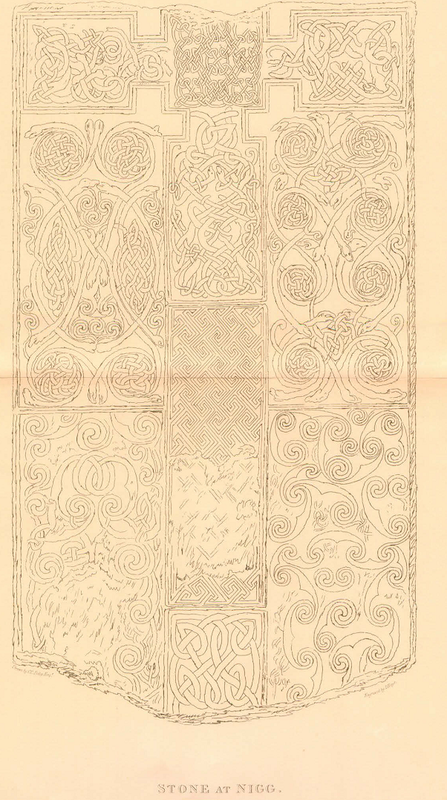 Charles Carter Petley (20-01-1780 to 29-08-1830) surveyed and drew the Tarbat symbol stones in the early 1800s. He lived at Tarbat; his birthplace was reputedly Geanies House in Fearn, and two water colours painted by Petley of Geanies can be seen here. There is no reason to suppose that Petley did not draw the stones exactly as he saw them. However time has not been kind to some of the stones and weathering has blurred the finer lines of the carving. Alan has been able to recover much of the detail with photogrammetry. 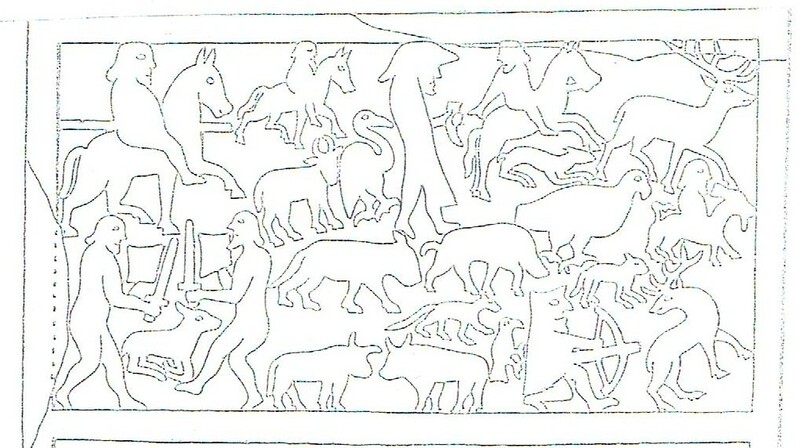 Petley’s early 19th Century drawing of the hunting panel. The full length drawings of both sides of the Shandwick Stone can be seen at the foot of this article. The stones were first described by a Banff minister Rev. Cordiner in the 18th Century. 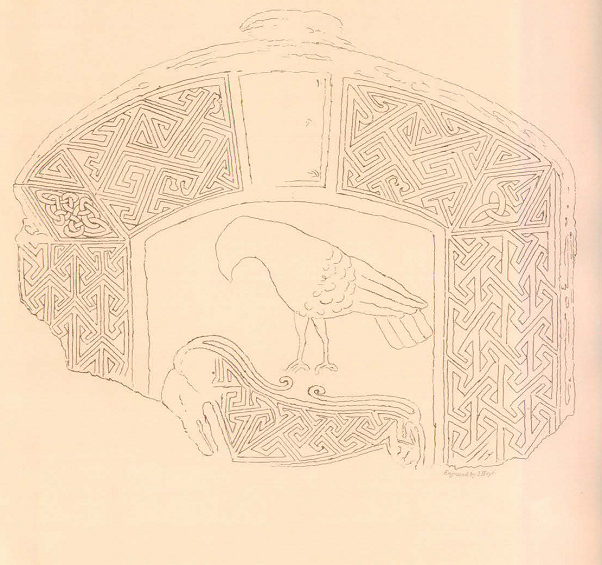 More recently J. Romilly Allen and Joseph Anderson described and drew them in their definitive work of 1903 – The Early Christian Monuments of Scotland. However they only expanded Petley’s description of the stones. 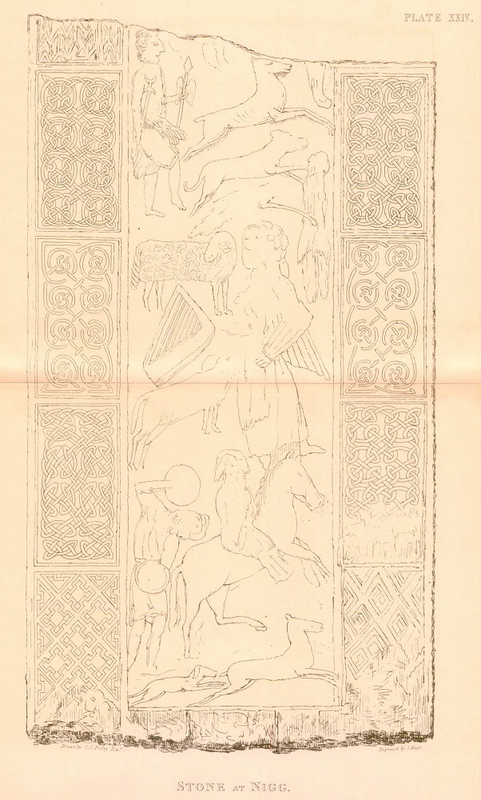 Petley’s description which includes the story about the Danish princes can be downloaded as a pdf – A Short Account of some Carved Stones in Ross-shire, accompanied with a Series of Outline Engraving. The enhanced photogrammetry image superimposed over Allen and Anderson’s drawing (Alan Thompson). On the combined image the drawing is shown with continuous lines on top of the original enhanced blue image. 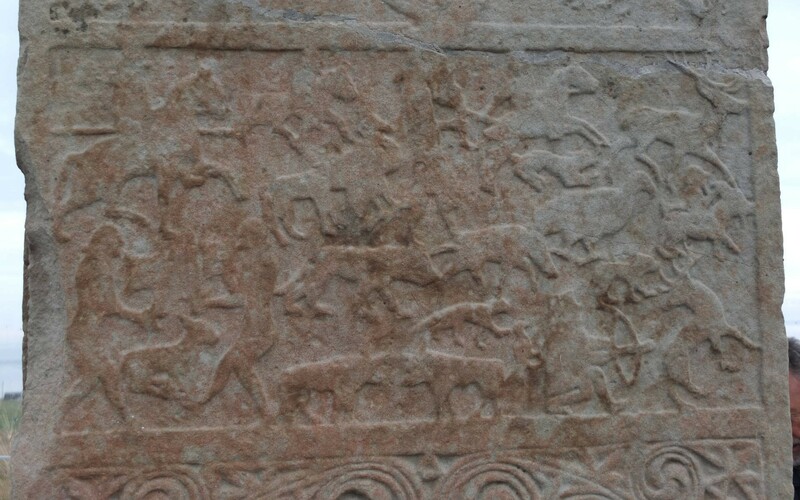 It is interesting to note the differences in the helmet of the top centre figure and the heads and backs of several of the animals. Can these differences be due to weathering on the stone between the early 20th century and the late 20th century when the stone was restored and remounted in the existing glass cover? Or could it be artistic interpretation by Allen and Anderson? Either way it is amazing how similar the two representations are. 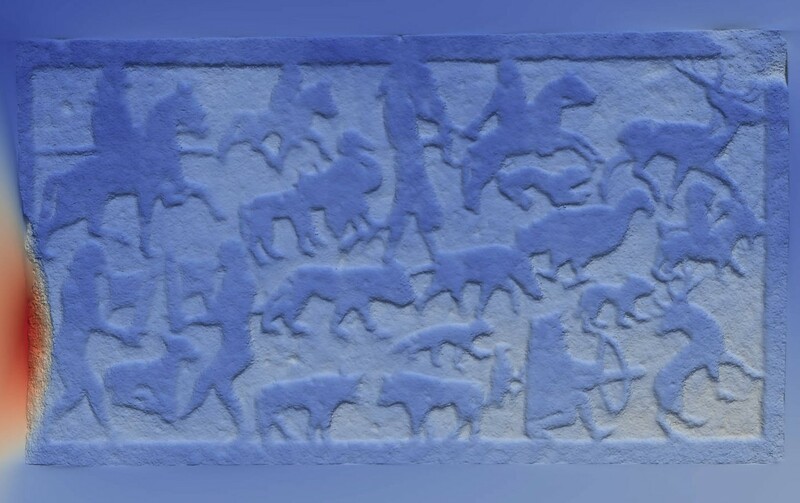 The hunting scene photogrammetry image superimposed over Petley’s early 19th Century drawing (Alan Thompson). 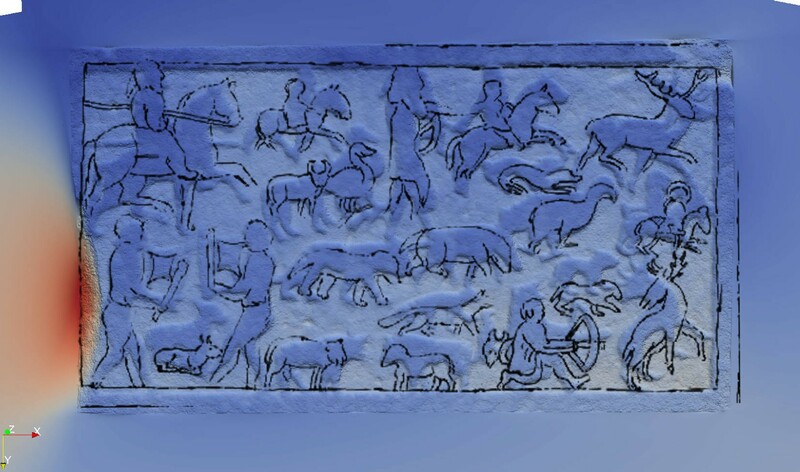 As a further experiment Alan superimposed the same enhanced photogrammetry image over the earlier drawing of the hunting panel by G C Petley. It was immediately obvious from this that the Allen and Anderson drawing is in fact a much more spatially accurate representation. It seems possible that their drawing was based on a rubbing of the panel, whereas Petley’s was only sketched. Again it is a matter of conjecture how much Petley’s drawing genuinely captures line detail lost from the stone in the last two centuries, and how much it demonstrates artistic license. As we saw on the NOSAS field trip, the Nigg stone has recently been cleaned and re-instated but does appear to have suffered rather a lot in the intervening 200+ years. The reverse side has almost become undecipherable and Petley’s drawing creates a picture which is much clearer. I find it very different to the other two stones which have more easily identifiable Pictish hunting scenes whereas the Nigg stone appears to have more Christian style carvings with an angel harp and lamb on the reverse side, see below. The separate triangular drawings are the now replaced top of the stone. With contributions by Anne Coombs, David Findlay, Alan Thompson and James McComas. 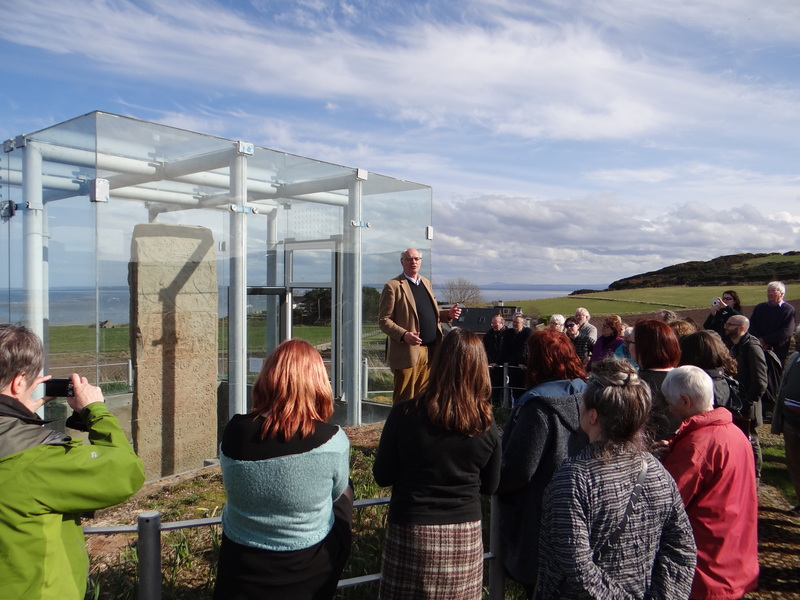 Professor Martin Carver giving a guided tour of the Shandwick stone at UHI’s Firths and Fjords Conference, April 2016. 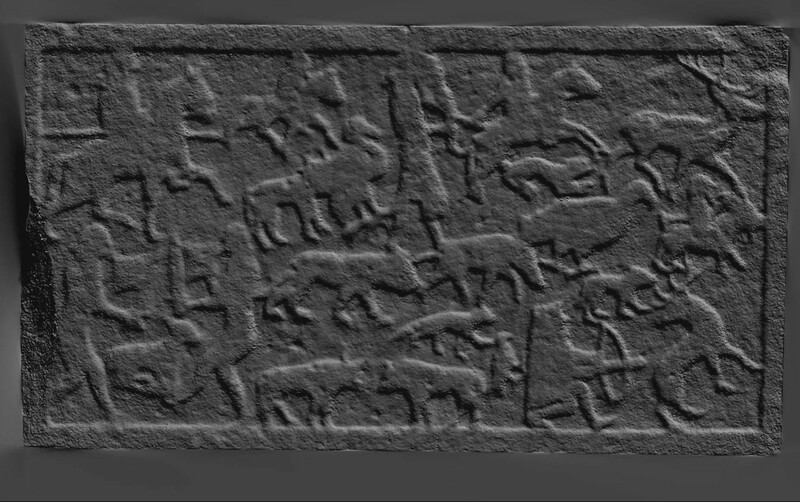 This entry was posted in General Archaeology, Pictish, Tarbat and Easter Ross and tagged A Short Account of some Carved Stones in Ross-shire, archaeology highlands, Clach a’Charaidh, Class 2 pictish stone, G C Petley, Geanies House, Hilton of Cadboll, J. Romilly Allen and Joseph Anderson, Nigg stone, North of Scotland Archaeological Society, NOSAS field trip, photogrammetry, Pictish, pictish archaeology, pictish cross slab, pictish standing stone, picts, Shandwick stone, Tarbat, Tarbat peninsula archaeology, The Early Christian Monuments of Scotland on November 23, 2015 by nosas.